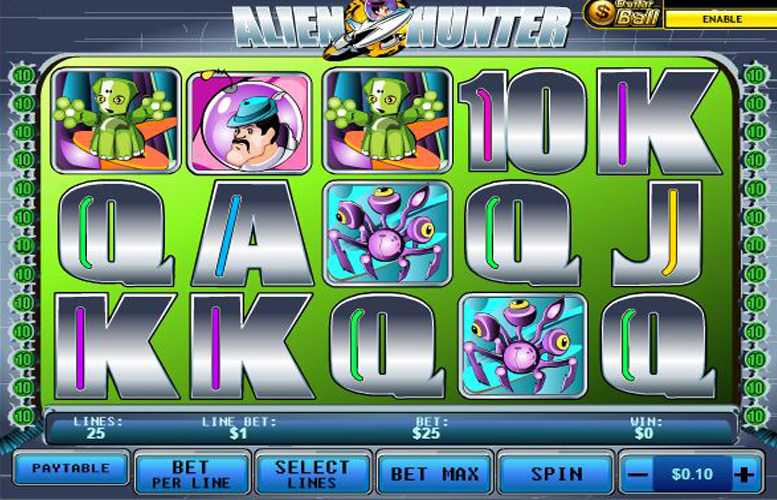 Inviting players to head out into space and to take on the creatures they discover there, Alien Hunter is a five reel and three row slot game which offers the chance to win prizes that are truly out of this world. Entirely set in the depths of outer space, the slot’s reels are populated with images of all kinds of alien creatures and additional features including two bonus games are all themed around attempts to capture them. Not one but two separate bonus games help to add a little extra to the slot and make gameplay more immersive. Scatter symbols that trigger free spins help players to further improve their chances of winning big. A good degree of staking options are provided to players. Whilst generous, the top possible payline jackpot of £50,000 is still a little lower than those found with many other slots. Alien Hunter’s additional features, and especially its bonus games, can be a little tough to understand at the outset. Alien Hunters players must explore the depths of outer space and go head-to-head with the creatures they find in order to win, and it is if five of the slot’s wild symbol lines up along an active payline that they will win the biggest jackpot. The wild symbol depicts a blue alien creature in a cage and pays out at a rate of 10,000 times the player’s line bet if five of them appear on an active payline. As a player can set a maximum bet per line of £5 that means that the value of the top jackpot can reach a maximum of £50,000. At heart, Alien Hunter is a five reel slot game but it also includes a whole host of additional features to make it more interesting. Those features include wild symbols, scatter symbols that trigger free spins and two different bonus games. Featuring an image of a cage blue alien, the Alien Hunter wild symbol can appear anywhere on the reels and substitutes for all other symbols – not including scatters or bonus symbols – to make up the most beneficial possible payline combination. That is alongside also being able to make up the most valuable combination of all itself, as explained above. Showing the spaceship which you must use to head out into space, the Alien Hunter scatter symbols trigger free spins when they appear on the reels. If three of the scatters appear five free spins are triggered, if four appear that increases to ten free spins and if five are shown on the reels, the total number of triggered free spins is 25. If the Alien Hunter egg bonus symbol appears on reel one and reel five, it triggers the collecting bonus game. In that game players must choose from a collection of alien eggs to reveal different cash prizes but need to be careful as an incorrect choice will end the game. Three of the spaceman bonus symbols appearing anywhere on the reels triggers the hunting bonus game. For that game, players must choose whether to play in ‘luck mode’ or ‘skill mode’. In luck mode, they can shoot slow moving aliens and then receive randomly chosen prize amounts. In skill mode, meanwhile, aliens move more quickly, players must shoot six in 15 seconds to win and what they win depends upon which aliens they shoot. As the slot’s premise is that you are a hunter looking to capture aliens, it should come as no surprise that the most valuable symbols on the reels are those depicting different extra-terrestrial beings. After the aforementioned wild, the next most valuable symbols are those showing an orange alien and a green alien. If five of the orange alien symbols appear along an active payline, the lucky player will receive a payout worth 1000 times their line bet. If it is five of the green alien symbols which arise, the jackpot will be worth 500 times the bet per line. Players don’t always want to bet the same amount per spin, and to cater for this Alien Hunter allows them to alter the number of active paylines, the number of coins bet per payline and the value of each of those coins for each spin. Anywhere from one up to the game’s maximum of 25 paylines can be active at any one time, and anywhere between one and ten coins can be wagered per payline. Those coins, meanwhile, can be worth a minimum of 1p, a maximum of £5 and a variety of other value options in between. Whether you think it’s out of this world is up to you, but there’s certainly plenty to admire about the Alien Hunter slot game. 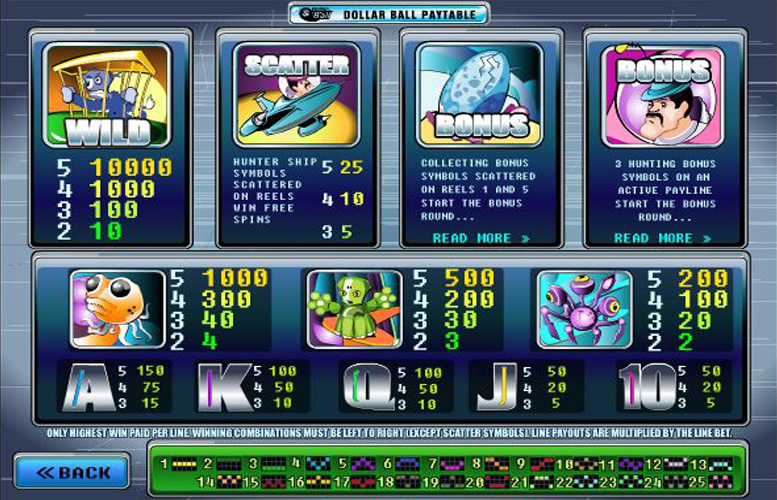 The slot does, after all, manage to combine an original theme with fun and immersive gameplay, without comprising too much on its size of jackpots. The futuristic out of space theme is sure to delight players looking for something a little different, and the inclusion of two separate bonus games is certain to keep their attention for longer, too. What’s more, those players can enjoy the slot regardless of their budget, thanks to the broad range of staking options provided. When they do play the Alien Hunter slot, players can win truly life-changing amounts of money, but it is perhaps worth mentioning that the game’s top jackpot is a little lower than those offered by a good number of other similar slots. This game has a rating of 3 / 5 with 327 total reviews by the users.